Nizamabad Medical Officer,Staff Nurse,Pharmacist,Lab Technician,Accountant,ANM Posts Recruitment: DHS Nizamabad UPHC Certain Posts 2016 Recruitment notification under NUHM: Government of Telangana, District Health Society, Nizamabad district has published the Medical Officer-Staff Nurse-Pharmacist-Lab-Technician-Accountant-ANM Posts recruitment notification and applications are invited from eligible candidates in the prescribed “Application Form” for recruitment of certain posts on contract basis under National Urban Health Mission. The contract is initially for a period of one Year and renewal will be as per the need and NHM yearly plan (PIP) and also subject to satisfactory performance. However, every year new contract has to be signed and valid for the period as indicated in the contract. Qualification: B.Sc (Nursing) or GNM. Qualification: S.S.C, MPHW(F) Training certificate and Midwives Council or Two years Intermediate Vocational MPHW(F) Course and have completed one year clinical training in selected Government Hospital. Qualification: Masters Degree in Psychology/ M.Phil in Rehabilitation Psychology/ Masters Degree in Psychology. Qualification: Master of Social Work/ Social Science. Age(as on 01.07.2017): 18 to 44 years. Last date: Last date for submission of applications 08.12.2017 at O/o Dist. Medical & Health Officer, Nizamabad, Akshara Pranalika Bhavan, Collectorate buildings. Last date for submission of applications: 08.12.2017. The Format of Applications may be downloaded from the District Official website after filled it may be submitted in person or by Registered post to O/o the Dist. Medical & Health Officer, Nizamabad. The date of receiving applications commences from 06/05/2016 at 10.30AM, and ends on 18/05/2016 by 5.00 P.M. The Selection committee is not responsible for any postal delays. a. 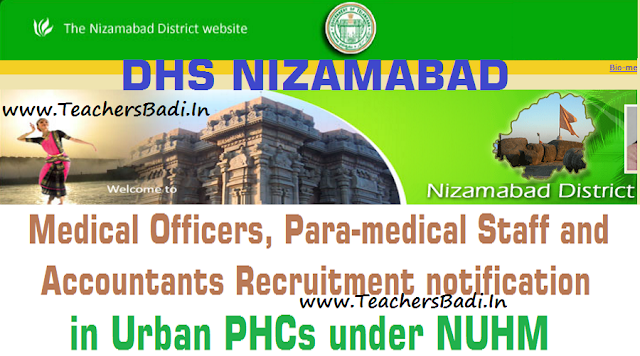 Application forms along with the instructions can be downloaded from official website www.Nizamabad.nic.in. b. Filled in application form shall be submitted in person or through registered post to O/o the District Medical & Health Officer, Nizamabad. Applications which are received after due dates will be summarily rejected. District Selection Committee is not responsible for postal delays.